The Outdoor Programs Office and the Dartmouth Mountaineering Club renovated the Jonathan Belden Daniels ’86 Memorial Climbing Gym this last winter break and changed its hours. DMC co-leader Alex Derenchuk ’19 said that part of the renovation involved decreasing the size of one side of the gym and adding a training room in its stead. According to its website, the DMC is partially responsible for providing staff and changing the climbing routes in the climbing gym. In addition to the structural changes, Morgan Haas, the assistant director for leadership and experiential education at Dartmouth outdoor programs and manager of the gym, said that the renovated side of the gym was rebuilt with steel framing. She added that the gym’s wall was repainted and that the flooring was replaced with professional-grade gym flooring. Co-leader of DMC Fisher Katlin ’19 said that a considerable amount of money was spent on purchasing new holds, which has improved the wall’s grip. The funding came from an anonymous donor, Haas said. Haas said that members of the climbing community at Dartmouth and the Upper Valley have been waiting for the renovation for a while. “We wanted to really up everybody’s training essentially because there is a ton of outdoors climbing around here and people use our gym to train for the climbing season,” Haas said. Derenchuk added that although the existing facilities were not falling apart, they were becoming old. “The walls were old and slippery, a lot of the bolts were broken and it was really dusty,” Derenchuk said. 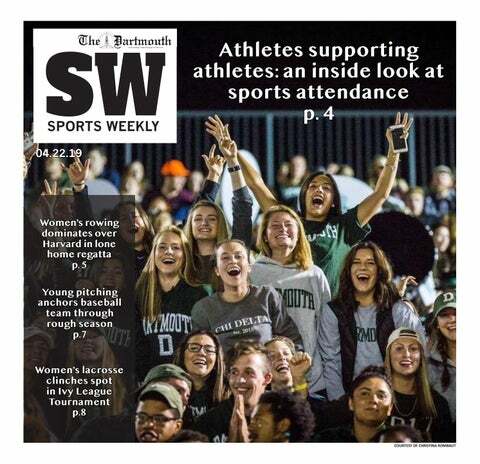 According to Haas, the number of Dartmouth students and Upper Valley community members climbing in the gym has increased since the renovation. She added that the gym’s online advertisements and its social media presence contributed to the spike in participation in and inquiries of various climbing programs. Derenchuk said that the renovation will continue to attract more climbers to the gym. In addition, the gym’s hours from Sunday to Thursday were changed, with it closing at 11 p.m. instead of 10 p.m. Its hours for Fridays and Saturdays, 5 p.m. to 10 p.m., have not changed. The gym will continue to host Women’s Climbing Night every Thursday, during which women can use the gym facilities for free. The program was started to create a more welcoming atmosphere for female climbers and to provide an opportunity for women to step out of their comfort zones and push their climbing limits, Haas said. She added that while revamping the other side of the climbing gym is definitely on the radar, no plan is set in stone yet. The gym is open to Upper Valley residents that are over the age of 18 and are members of the Dartmouth Outing Club, as well as all Dartmouth students, faculty and employees.